Peace was the No. 1 paid app on iTunes before its developer took it down. The app blocked mobile ads on websites. Peace was Apple's top-paid app until its developer took it down on Friday, just three days after its launch. Developer Marco Arment said he removed the ad-blocking app because he had a change of heart about how it worked. Users loved it, but Arment explained on his blog Friday that his app hurts people who make a living from ad-supported businesses. That includes news organizations and smaller sites. As his app rose in popularity, so did the consequences and his discomfort. "I still believe that ad blockers are necessary today... but I've learned over the last few crazy days that I don't feel good making one and being the arbiter of what's blocked," he wrote. 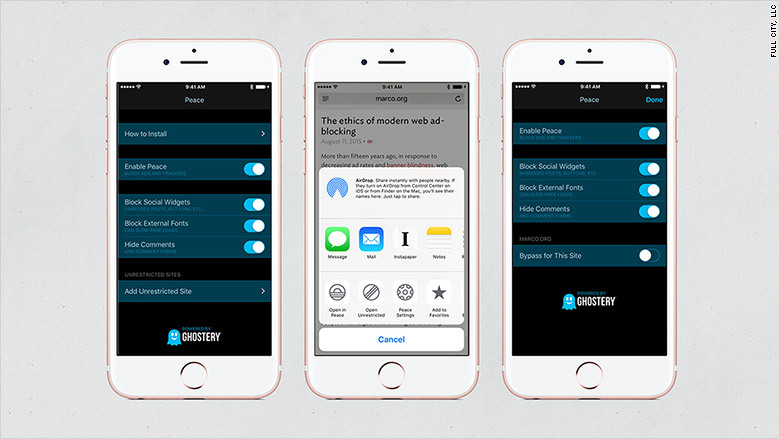 Peace lets users block ads and trackers while browsing the Web on their iPhone or iPads. The app also blocks social posts and buttons, comments, and special fonts. The app's software identifies what to block using a special database maintained by another company, Ghostery, so there isn't an easy way to make exceptions. "This approach is too blunt, and Ghostery and I have both decided that it doesn't serve our goals or beliefs well enough," he explained. Screenshots of the app from a cached version of the iTunes store. Arment's supporters praised him for taking the app down, calling it a bold move. However, many people criticized him for making a rash and sweeping decision. After all, he could have tweaked it to be less heavy-handed. Some also questioned his motives because his own ad publisher attacked him on Twitter. Others said he knew what he was doing and it wasn't fair to abandon his customers. @marcoarment Be you. But releasing, especially paid, is an implied commitment. Be sure to answer your own uncertainties first, next time. @marcoarment I'm disappointed that you pulled Peace rather than improve the customizability of it. @marcoarment Man, that's disappointing. Surely there could have been some kind of alternative course of action. "I know pulling Peace from the store after just two days is going to be an immensely unpopular move, and subject me to a torrent of unpleasantness," he said. "But that'll end soon enough, and that's better than how I'd feel if I kept going." Even though the app is no longer on the Apple App store, users who previously downloaded Peace can still use it. But Arment said he won't make future updates. He's also offering a $3 refund for the cost of the app. Arment ended his post by suggesting users turn to two competitor ad blocking apps, Purify and Crystal. Apple launched the ability to sell ad blocking apps in its iOS 9 release on Wednesday.